Case Study: National Forest Planning in the U.S. 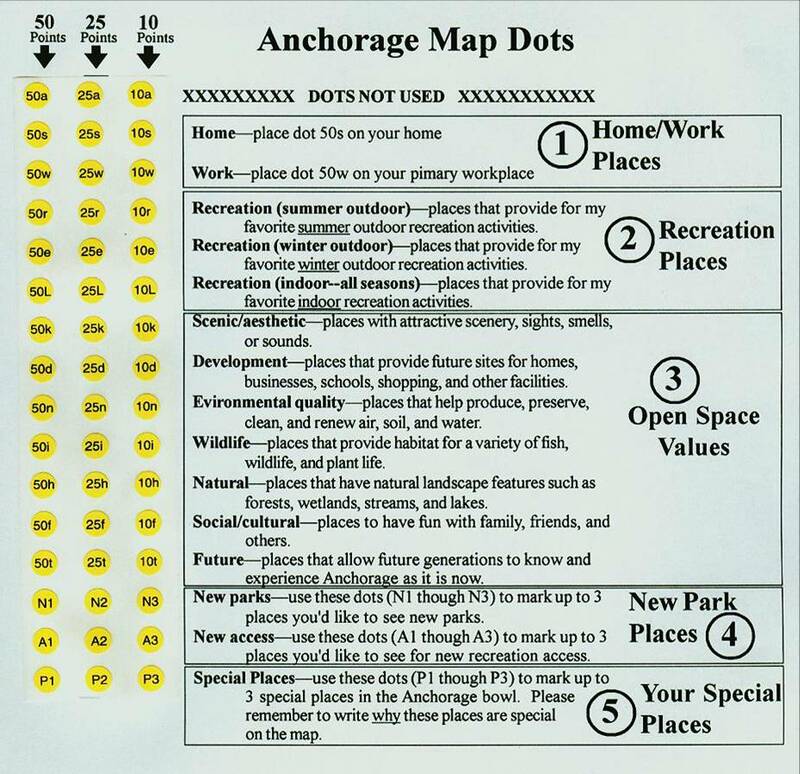 The first application of mapping landscape values was for the Chugach National Forest (Alaska) planning process in 1998. 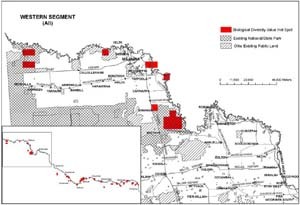 Survey questionnaires along with national forest maps and a typology of 12 forest values were sent to randomly selected households in 12 communities surrounding the forest. The overall response rate was 32 percent. 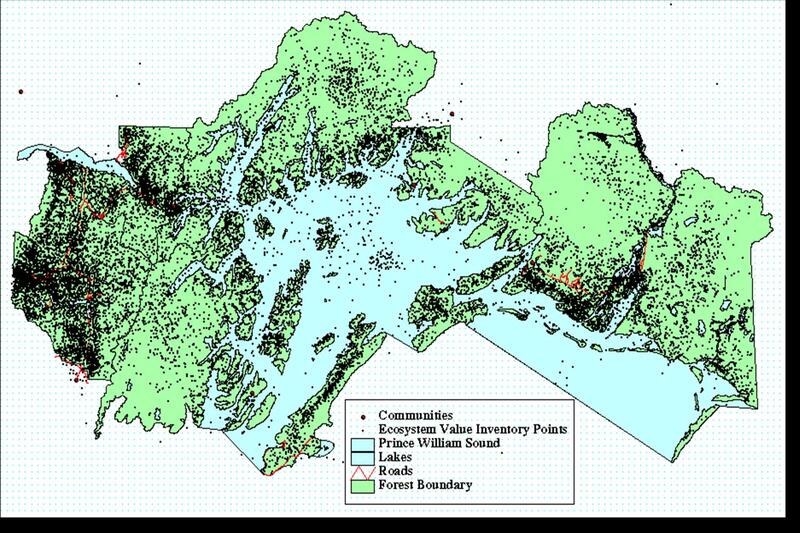 About 17,000 values were mapped on the approximately 5.5 million acre forest. 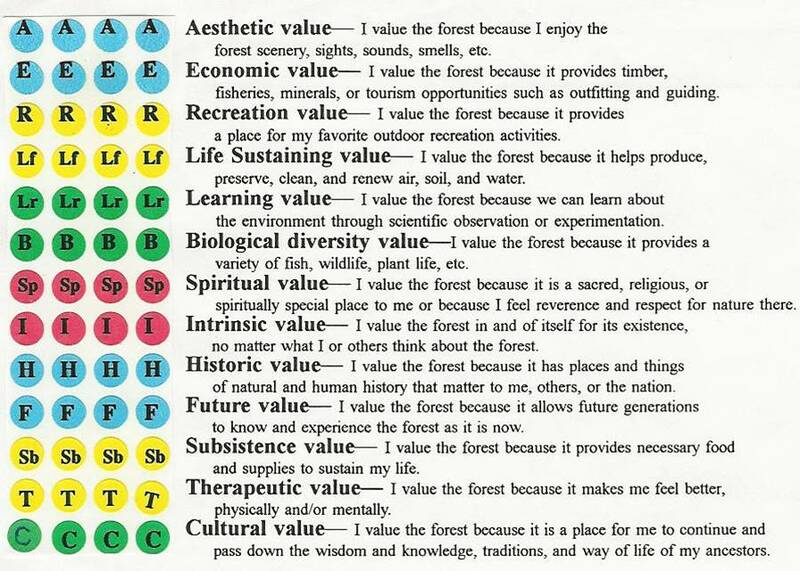 A decision support method and model called Values Suitability (Compatibility) Analysis was developed to show which forest management options were most consistent with publicly held landscape values. 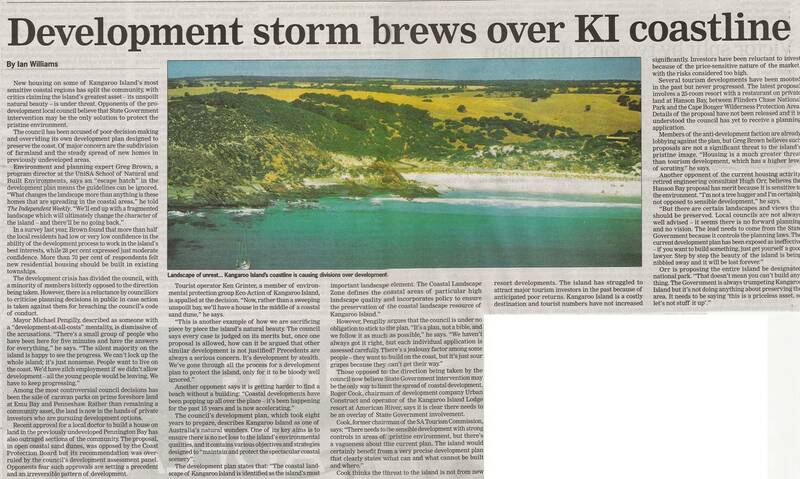 Case Study: Tourism Development on Kangaroo Island, Australia. Kangaroo Island, South Australia is an international tourist destination receiving over 150,000 visitors annually. 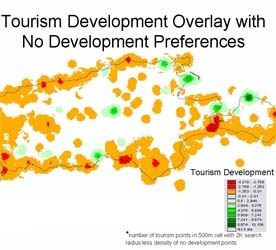 Its peaceful rural character and the abundance of wildlife sustained by a large national park and reserve system have resulted in conflict over potential tourism development. 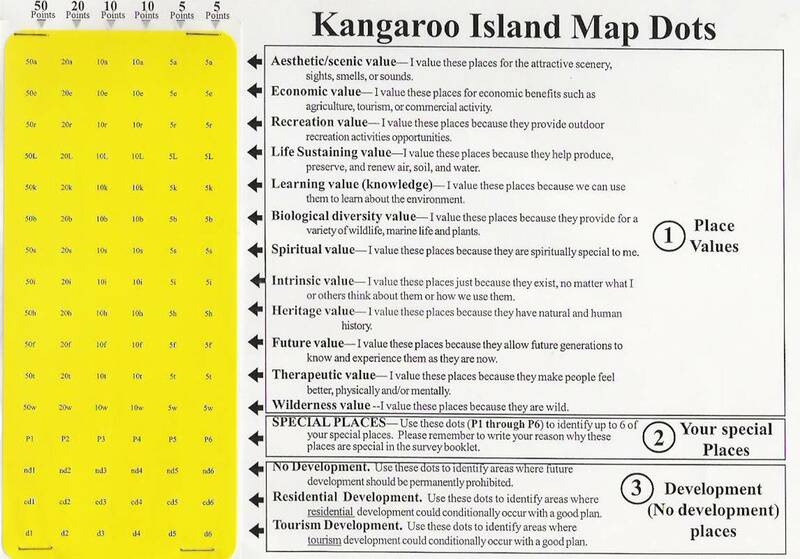 A 2004 study of Kangaroo Island residents mapped both landscape values and development preferences. 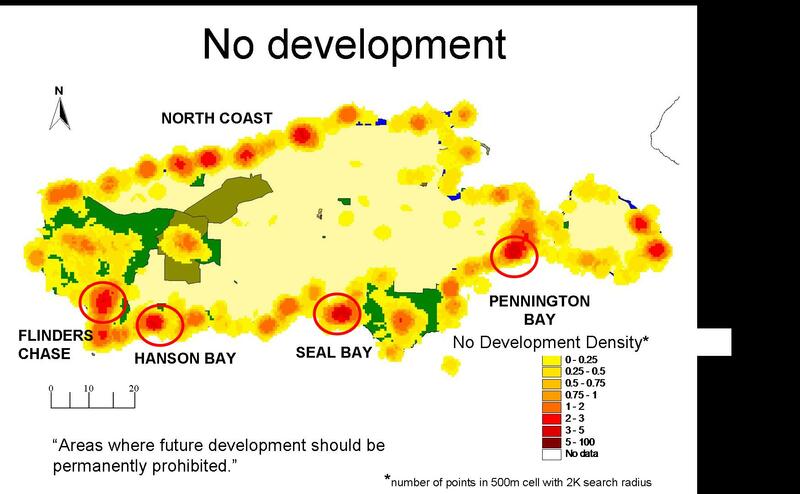 The mapping of landscape values and development preferences indicate that residents would limit future tourism and residential development to protect scenic coastlines and the integrity of the reserve system. Landscape values and special places exist in urban areas in parks and open spaces. The typology of landscape values for urban areas is modified for mapping urban areas but the mapping method works. 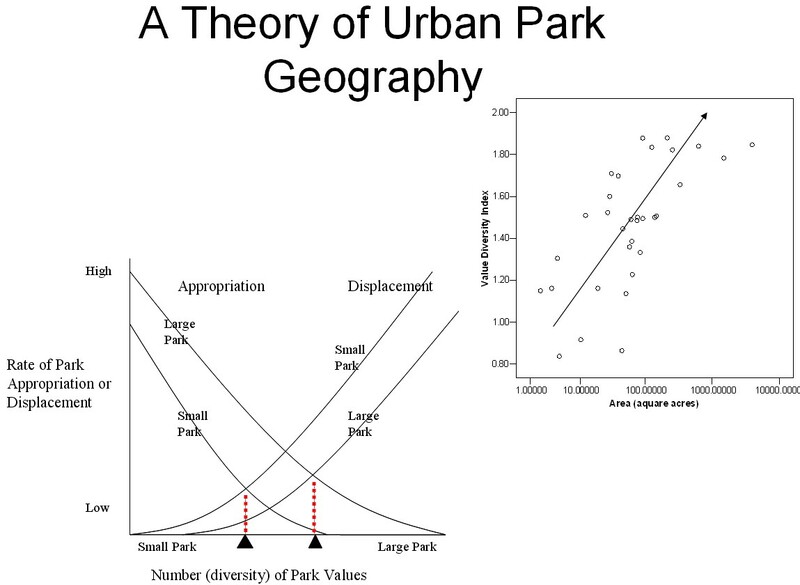 Empirical data from Anchorage indicate that larger parks have a greater diversity of landscape values than smaller parks and that proximity of parks to concentrated human habitation may also increase park value diversity. 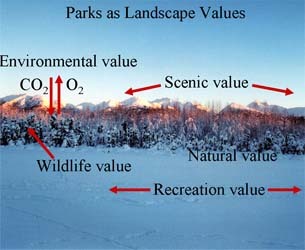 In some parks and/or open spaces, the non-use value may exceed the use value. Park planners and managers would benefit from knowing the abundance and diversity of urban landscape values to better provide for resident and visitor needs. Highway corridors provide a linear distribution of landscape values with the type and density of landscape values varying along the length of the corridor. 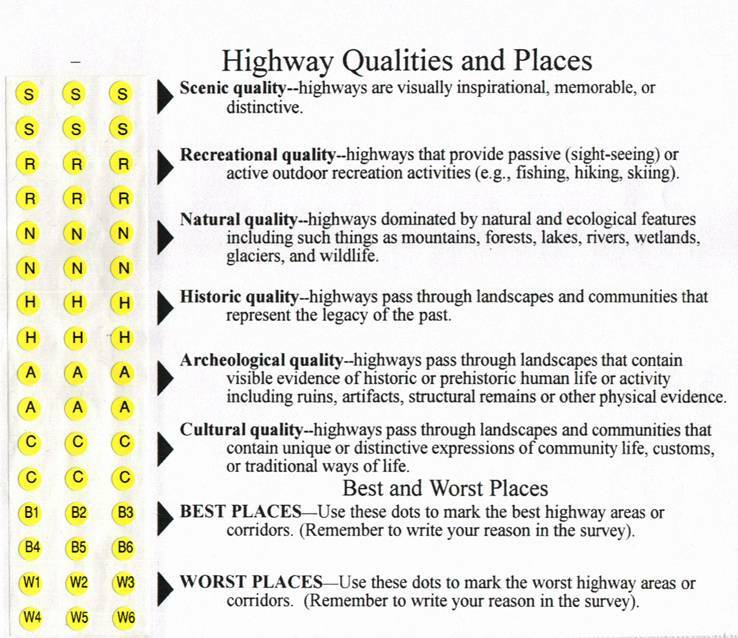 In the U.S., "Scenic Byways" and "All-American" roads are said to provide an unusually high proportion of certain landscape values or "qualities" (i.e., scenic, recreational, natural, historic, archeological, and cultural qualities). 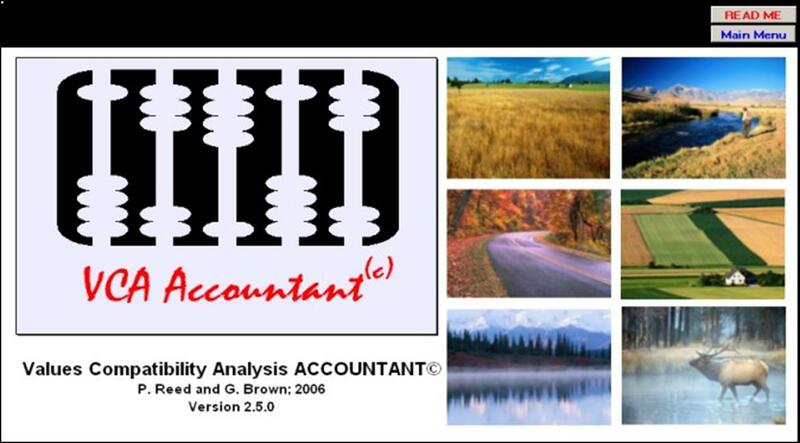 Landscape value mapping is an effective method for documenting the presence of these qualities along highway corridors. In the image at left, highway quality hotspots such as these in Alaska can be mapped for a highway system leading to a rational and defensible Scenic Byway nomination process. The Otways region in southern Victoria, Australia is a region in transition. The historical ties to forestry and logging are yielding to increased demand for environmental protection and expanded recreation opportunities. If one were to select multiple use lands for conversion to national parks, how should such lands be allocated? A predictive model was developed that used the existing mix of landscape values held by residents and visitors for private, state forest, and national park lands to predict the best lands for conversion to national parks. 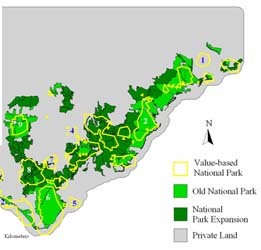 The so-called "values-based" new national parks (shown at left) derived from the model were reasonable predictors of the actual allocations made by the Victorian government. The Murray River in Australia is vital to the health of the country. Lands in the river corridor and floodplain provide for a variety of land uses (e.g., agriculture, housing, recreation, tourism) and areas of public lands for conservation. Researchers at Monash University in Australia mapped community and visitor landscape values along a nearly 2000 km reach of the river from its headwaters to the South Australian border. 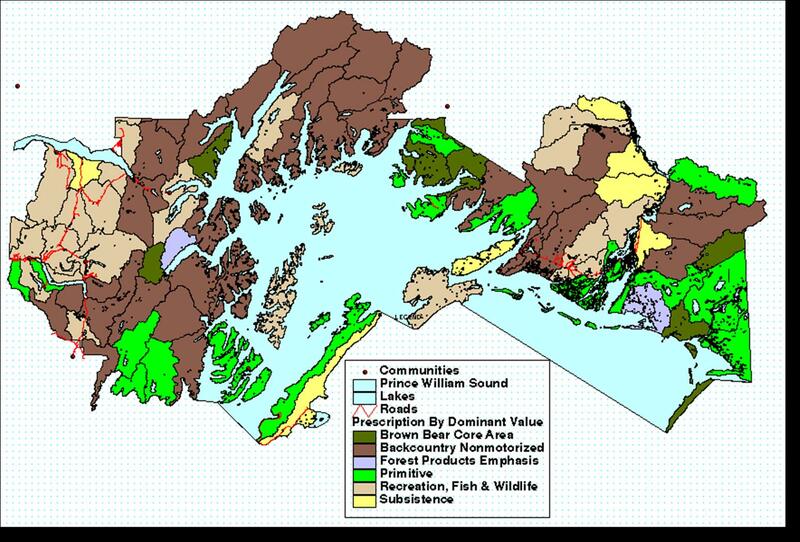 An important objective for the researchers was the identification of lands containing significant concentrations of landscape values that support river conservation (e.g., wilderness, biodiversity, and life sustaining values). Do existing public lands (e.g., national parks and state forests) provide enough protection for river conservation? Researchers identified landscape value hotspots using the G statistic, a localized measure of spatial concentration. 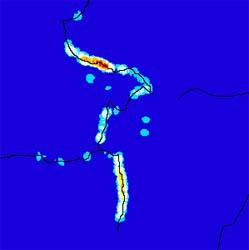 The G statistic identifies clusters of cells with density values of a particular landscape value higher in magnitude than might be expected by random chance. 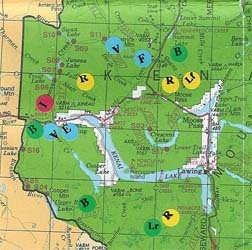 The map to the left shows biological hotspots (in red) for the Western reach of the river. 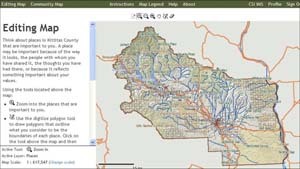 The Kittitas County Open Mapping Project is a PPGIS project designed to build consensus about land use priorities in Kittitas County, Washington (U.S.). This project is an effort to map information for decision makers that can be used to protect and promote unique and valued places in Kittitas County. The project was developed and implemented by the Center for Spatial Information at Central Washington University. Individuals use an interactive mapping system (IMS) of Kittitas Country to draw polygons that identify areas that contribute to the quality of life in the county. Individuals also provide descriptive phrases and adjectives to describe the mapped polygons. One of the strengths of this PPGIS application was that it was built using completely Open Source software. For more information about the project, contact Anthony Gabriel or David Cordner at the Center for Spatial Information.